Renowned watchmaker Dubey & Schalden brand, founded in 1946, presented at the hourly market a new model of Grand Shar DBT Ti Tourbillon. 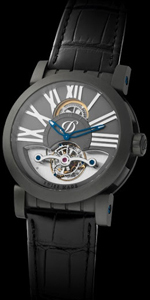 This is the first model from the brand, equipped with a tourbillon. Novelty is presented in a circular enclosure with a diameter of 44 mm titanium with a patented coating that gives the material hardness and mechanical resistance to external influences. Its color is due to elektroplazmennoy processing, which is carried out by masters of the company. This technology has been used previously only in the most innovative industries such as aerospace and medical industries. The dial features silver-anthracite large Roman numerals and blued skeletonirovannymi arrows coated fluorescent substance SuperLuminova. At the bottom of the dial set to “6:00” is the tourbillon. Protects face a convex sapphire crystal. At the end of the crown, which is in the “3:00” is engraved logo Dubey & Schaldenbrand. Model Grand Shar DBT Ti Tourbillon mechanism is assembled on the basis of 8001 with a tourbillon at 21 stones, with a frequency of 21,600 vibrations per hour, 100-hour power reserve and features: hours, minutes. Water Resistant – 50 meters. Available model black leather strap with a buckle made of titanium.